MINI - AUSTIN , MORRIS , BL & ROVER. The Mini is a small economy car that was made by the British Motor Corporation (BMC) and its successors from 1959 until 2000. The original is considered a British icon of the 1960s, and its space-saving front-wheel drive layout – allowing 80 per cent of the area of the car's floorpan to be used for passengers and luggage – influenced a generation of car makers. The vehicle is in some ways considered the British equivalent of its German contemporary the Volkswagen Beetle, which enjoyed similar popularity in North America. 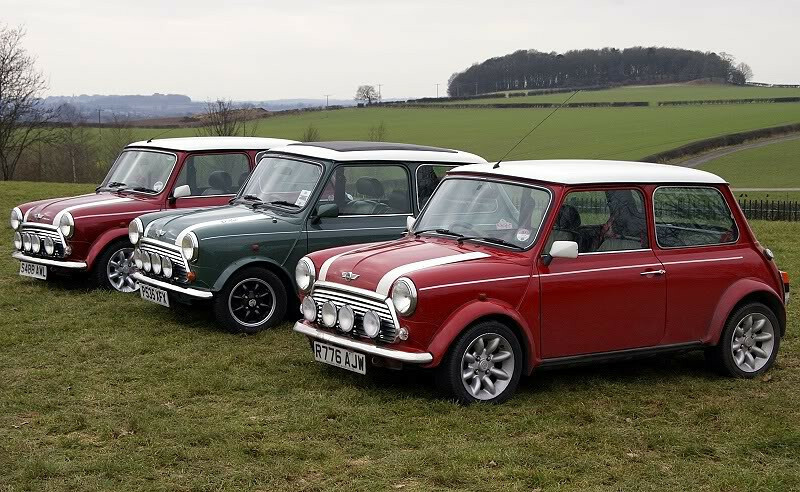 In 1999 the Mini was voted the second most influential car of the 20th century, behind the Ford Model T.
The Mini was originally a product of the British Motor Corporation, which in 1966 became part of British Motor Holdings. British Motor Holdings merged with Leyland Motors in 1968 to form British Leyland. Mini became a marque in its own right in 1969. In the 1980s, British Leyland was broken-up and in 1988 Rover Group, including Mini, was acquired by British Aerospace. In 1994, Rover Group was acquired by BMW. In 2000, Rover Group was broken up by BMW, with BMW retaining the Mini brand.